Collect early morning, mid-stream urine in a wide neck container and avoid contamination with skin. Label the specimen with patient’s particulars. The sample should be transported to lab as soon as possible. If there is a delay of 1 hour or more, add 0.2 g of boric acid in 20 ml of urine or refrigerate at 4ºC. If it is cloudy and red, then either bacterial infection or Schistosomiasis should be suspected. 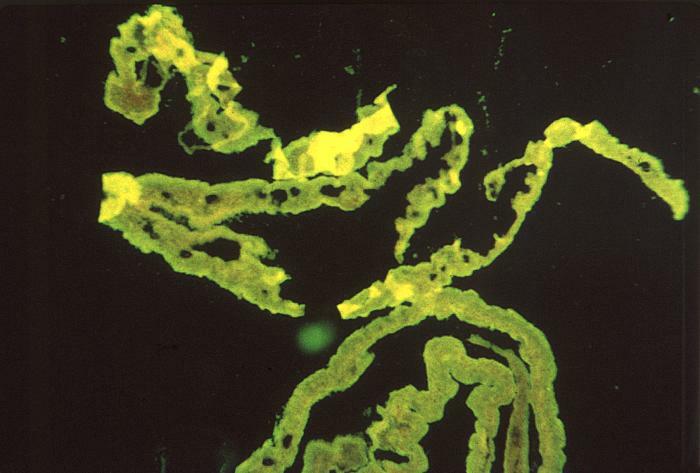 If it is brown and cloudy, then black water fever (Plasmodium falciparum) or other conditions that cause intravascular hemolysis should be suspected. If it is yellow or orange colored, it may be hepatocellular jaundice. Normally it is aromatic. It can be foul smelling in UTI and fruity in diabetes mellitus. Normally specific gravity is 1.004-1.014 and is acidic. Its acidity increases in E. coli infection and is alkaline in Proteus infection. Usually seen at 10x. They are seen in vaginal contamination of sample or inflammation of urinary tract. They are reported as few, moderate or many, per low power field. They are nucleated and vary in size and shape. Differentiated from RBCs by oval shape and budding. Usually seen in women with vaginal candidiasis, diabetics or in immunocompromised. Smaller and more refractile and contain no granules. They are seen in Schistosomiasis, heavy bacterial infections, acute glomerulonephritis, calculi or malignancy of urinary tract or sickle cell disease.